Born in 1926 as Princess Elizabeth Alexandra Mary to Prince Albert, the Duke of York (and future King George VI) and Elizabeth Bowes-Lyon, it did not always seem that Elizabeth would one day inherit the throne. However, with the abdication crisis, her father became king and ensured that his eldest daughter would eventually become Queen Elizabeth II. Overseeing the United Kingdom through the Cold War and into the 21st Century, Elizabeth has become the longest-reigning monarch in British history—even longer than Queen Victoria. With so much history in her time on the throne, here are ten facts you might not know. There’s 48 hours left to pick up the special reprint run of The Longest Reign, our tribute to the Queen’s Milestone. Perfect Christmas Gift! We will not offer this design again before Christmas. The Queen has reigned for 63 years and seven months – calculated at 23,226 days and about 16 hours. In that time, she has conferred 404,500 honors and awards and held 610 investitures. What’s more, she is only the 40th monarch since William the Conqueror was crowned in 1066. There have been twelve Prime Ministers over the course of her reign. There have also been twelve U.S. Presidents during this time. According to sources, the Queen’s secret talent is actually doing humorous impressions. However, nobody is telling whom she impersonates for private audiences. According to Prince William, the Duke of Cambridge, impressions of comedian Sacha Baron Cohen’s Ali G character can make her laugh. When Elizabeth married Philip Mountbatten (now Duke of Edinburgh) in 1947, Britain was still recovering from World War II and rationing was still in effect. As such, Elizabeth had to save enough rationing coupons in order to have her dress made. The Queen Mother and Prime Minister Winston Churchill were adamant about her not taking Philip’s surname so that the family line would still be the House of Windsor. Queen Elizabeth doesn’t wake up the same way as the rest of us. Rather than an alarm clock, she has her own personal bagpipe player that rouses her from slumber. 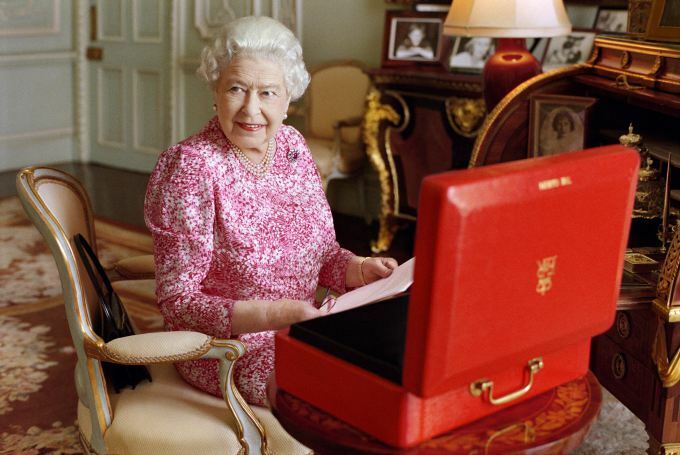 The Queen has undertaken over 250 official visits overseas to 129 different countries, all without her own passport. Her trips have brought her not only to Commonwealth Nations, but countries as diverse as Cocos Islands and China. It is well-known that the Queen broadcasts her Christmas message every year, the one exception being in 1969, when a documentary film about the royal family was broadcast. Instead, the Queen issued a written message. Additionally, Elizabeth and Prince Philip have sent over 45,000 Christmas cards and given 90,000 puddings to staff. The Queen is also responsible for sending Christmas Trees to Westminster Abbey, Wellington Barracks, St. Paul’s Cathedral, St. Giles’ Cathedral, the Canongate Kirk, Crathie Kirk, and schools in the Sandringham area. In addition to having no passport, Her Majesty also lacks a driver’s license. She first learned to drive in 1945 as a member of the Women’s Auxiliary Territorial Service, where she trained as a mechanic and military truck driver. Technology has seen an explosion of advancement during Elizabeth’s reign. In 1976, she became the first head of state to use email when she transmitted a message over ARPANET, a precursor to the Internet, while taking part in a demonstration at the Royal Signals and Radar Establishment. In 2009, US President Barack Obama gave her an iPod, even though she already had one, though this iPod contained footage of her 2007 visit to the United States. Corgis have famously been Her Majesty’s favorite pet since her first, Susan, was given to her in 1944. She has owned more than 30 since then, with many of them being descendants of Susan. 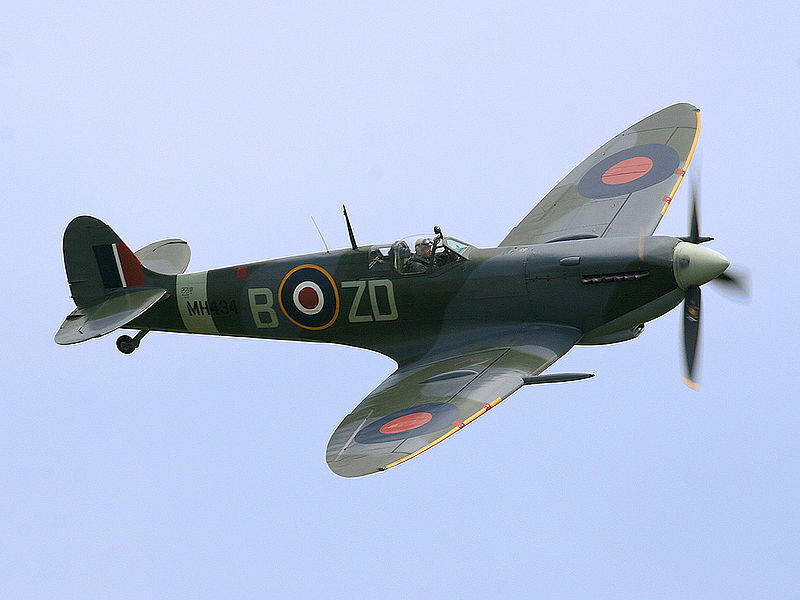 The Supermarine Spitfire is one of the most iconic airplanes ever built. It’s best known as the plane flown by pilots during the Battle of Britain (along with the Hawker Hurricane). 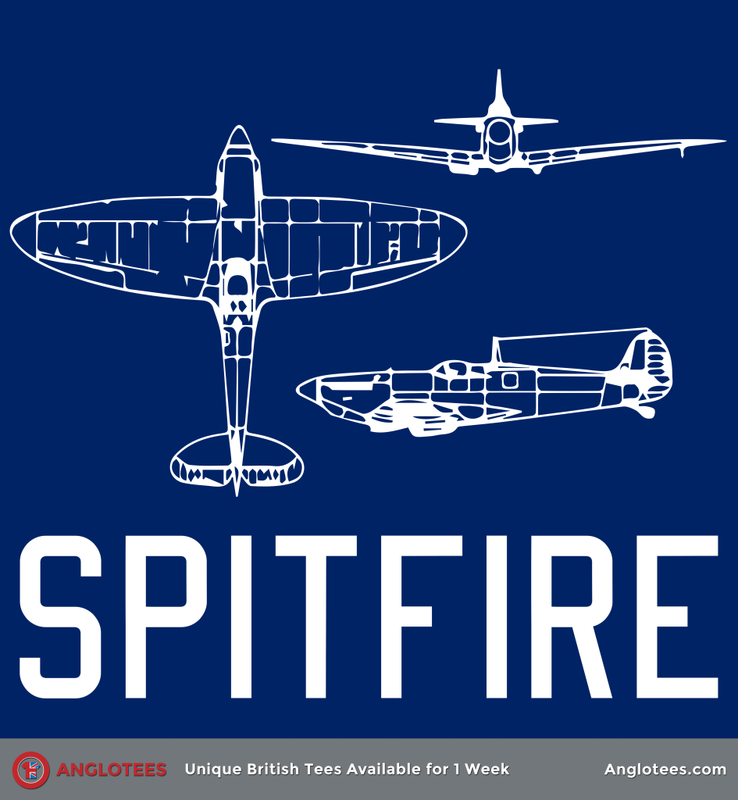 In honor of our current shirt at Anglotees, Spitfire Schematic, we present 14 facts and figures you probably didn’t know about the Supermarine Spitfire. 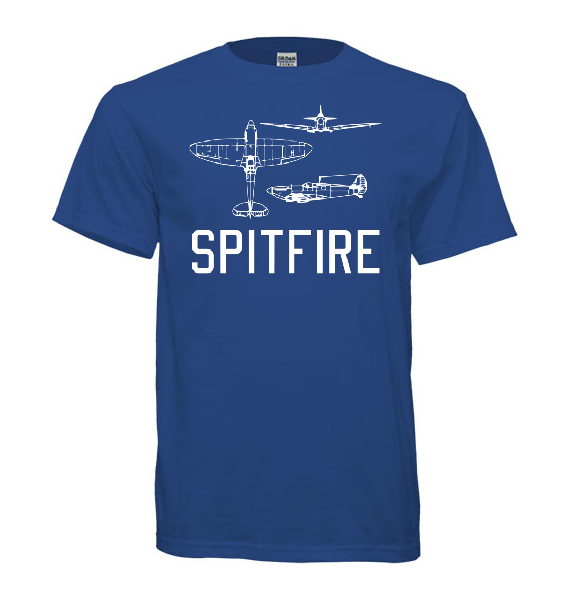 There’s still 72 hours left to get your own Spitfire Schematic T-shirt. Available in men’s, women’s, v-neck, long sleeve, sweatshirt and hoodie starting at $16.99 and shipping worldwide from the USA! 1. What Makes the Spitfire so special? Its sleek lines, its maneuverability and the power put out by its Merlin engines. It was almost unmatched in the air during the early years of the war. 2. The Spitfire was designed as a short-range, high-performance interceptor aircraft by R. J. Mitchell, chief designer at Supermarine Aviation Works in Southampton . In accordance with its role as an interceptor, Mitchell designed the Spitfire’s distinctive elliptical wing to have the thinnest possible cross-section; this thin wing enabled the Spitfire to have a higher top speed than several contemporary fighters, including the Hawker Hurricane. Mitchell continued to refine the design until his death from cancer in 1937, whereupon his colleague Joseph Smith took over as chief designer, overseeing the development of the Spitfire through its multitude of variants. 4. While the Spitfire was in service, there were 20,351 total built. Today there are just 179 left today in various states of decay. 5. 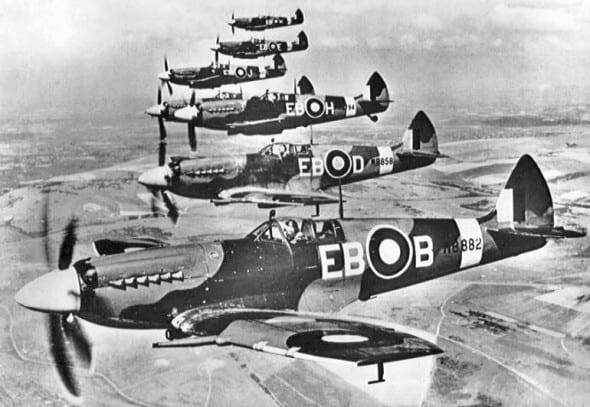 The Spitfire was the only Allied aircraft to be built during the entire war. 6. Because so many Spitfires were built, there were plenty of leftovers after the war. This meant that when filmmakers produced the iconic film Battle of Britain in 1968, they could use the actual planes flown in the battles. Many were also flown by veteran pilots. 7. It was one of the first airplanes to feature retractable landing gear. This was so new that many new pilots often crash landed because they forgot to put down their landing gear, assuming it was already down. 8. The Spitfire’s maiden flight was on 5 March 1936. It entered service with the RAF in 1938 and remained there until 1955. 9. Though it is assumed that ‘Spitfire’ came from the aeroplane’s awesome firing capabilities, it was also an Elizabethan word that meant someone who had a fiery character. The names Snipe and Shrew were also considered for the plane. Thankfully they went with Spitfire! 10. If you have a pilot’s license and £5500 (about $8500) you can attend the Boultbee Flight Academy in Kent, England and learn how to fly a real Spitfire. This is on my bucket list. 11. Some of the planes had modifications made to their under the wing mountings. Instead of carrying bombs, the planes could carry two small barrels of beer, something that was very popular with pilots! 12. The Spitfire continues to be a very popular aircraft, with approximately 55 Spitfires still being airworthy, while many more are static exhibits in aviation museums all over the world including here in the USA. I’ve seen the Spitfire inflight twice now and it was an amazing sight – can’t wait to see it again. 13. A single spitfire cost £12,604 to produce in 1939 – about £681,000 in today’s money or about $1.15 Million, which is rather cheap for an aircraft of its ability! 14. The maximum top speed of the Spitfire was 363 MPH – quite zippy! It’s range was 991 Nautical Miles but when it was in combat, it’s range was about 410 nautical miles. It could fly up to 36,000 feet, but the cabin was not pressurized. 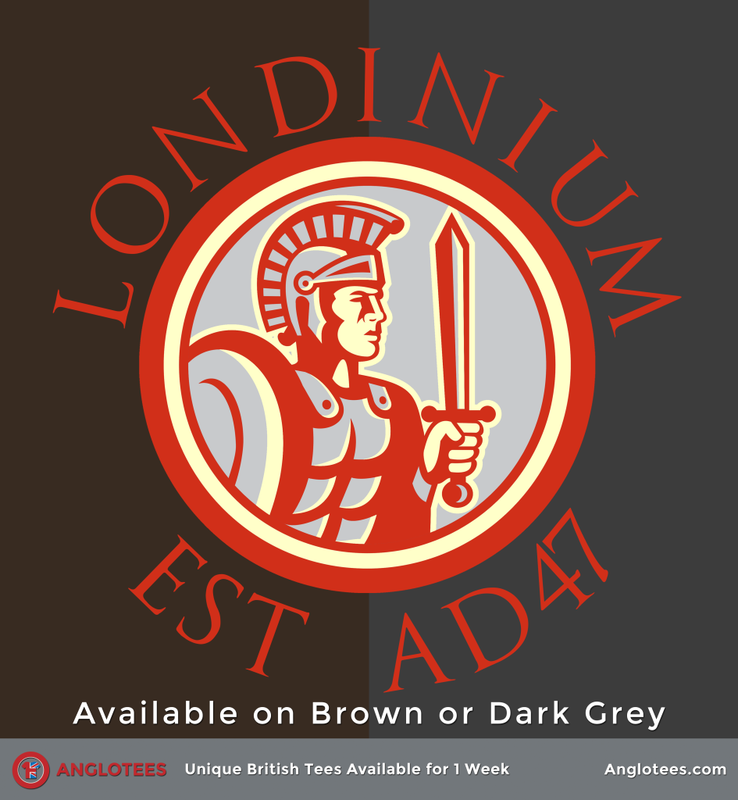 Our runaway hit design this week is Londinium, our tribute to London’s roman foundations. So, we thought it would be fun to put together 10 interesting facts and figures about Roman London that you might not know. 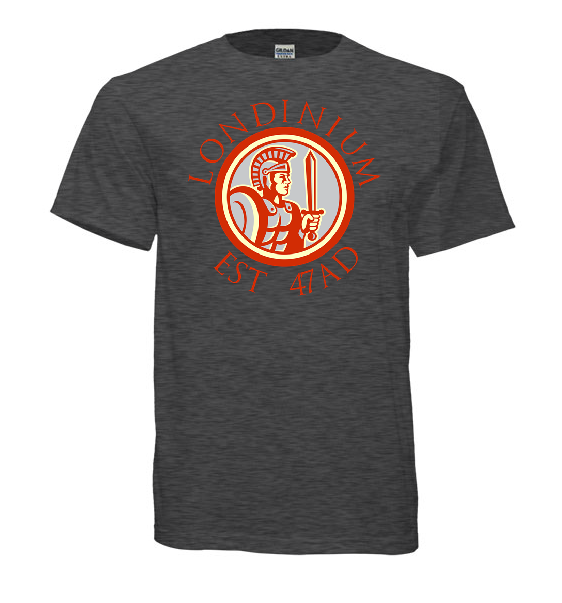 There’s still 72 hours left to pick up Londinium – our tribute to Roman London. Available in men’s, women’s, v-neck, long sleeve, hoodie, tote bag and sweatshirt on Dark Grey or Brown garments. Starting at $16.99 and shipping worldwide from the USA. 1. Londinium was founded by the Romans in AD 47 (or 47 CE) on the banks of the Thames roughly where the current square mile ‘City of London’ is located. 2. They chose the spot on the River Thames because the River Thames was quick way to transport goods between Britain and the Continent. The Romans saw this and built the town of Londinium around the river’s main crossing point. They built the first London Bridge. 3. In AD 61 the native Iceni tribe, led by Queen Boudicca, rose up against the Romans. They burnt Londinium to the ground and killed 30,000 Londoners. 5. The Romans built many major structures in Londinium including temples, bathhouses, a basilica for meetings, and a governor’s palace. Around 200 AD, they built a defensive wall around the city called London Wall. The wall was around three miles long, 20 feet high, and 8 feet wide. 6. You can still see bits of the Roman Wall that surrounded the city today. See the biggest pieces are the Museum of London. 7. Excavation has revealed extensive evidence of destruction by fire from when Boudicca burned the city in the form of a layer of red ash beneath the city. 8. The road network that the Romans built is still largely in place as modern roads in Britain. Of the fifteen British routes recorded in the 2nd- or 3rd-century, seven ran to or from Londinium. 9. 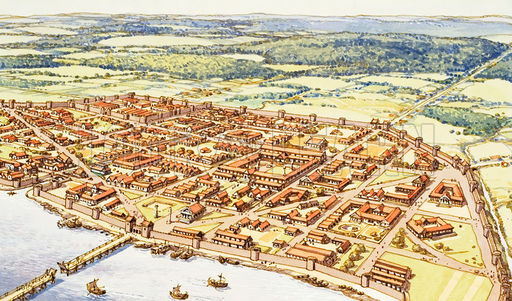 Despite its importance, Londinium was not the capital of Roman Britain. It was Camulodunum (modern day Colchester) first before Londinium eventually replaced it. 10. Emperor Hadrian visited in 122. The impressive public buildings from around this period may have been initially constructed in preparation for his visit or during the rebuilding which followed the “Hadrianic Fire”. This fire, which archaeologists have discovered destroyed much of the city, is not recorded by any surviving source and seems to have occurred in a time of relative calm in Britain; for those reasons, it is generally assumed to have been accidental. 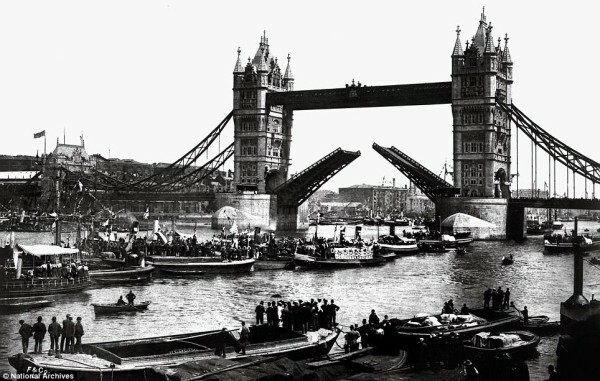 This year marks 121 years ago that Tower Bridge was officially opened by the Prince of Wales (not the current one obviously). 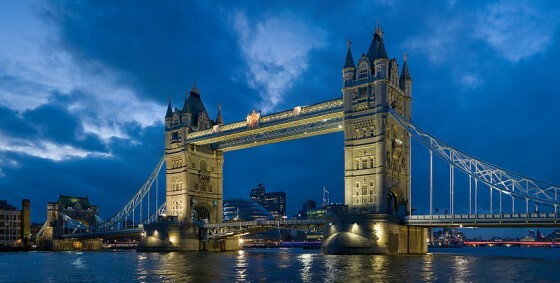 This special bridge is one that many associate with London. 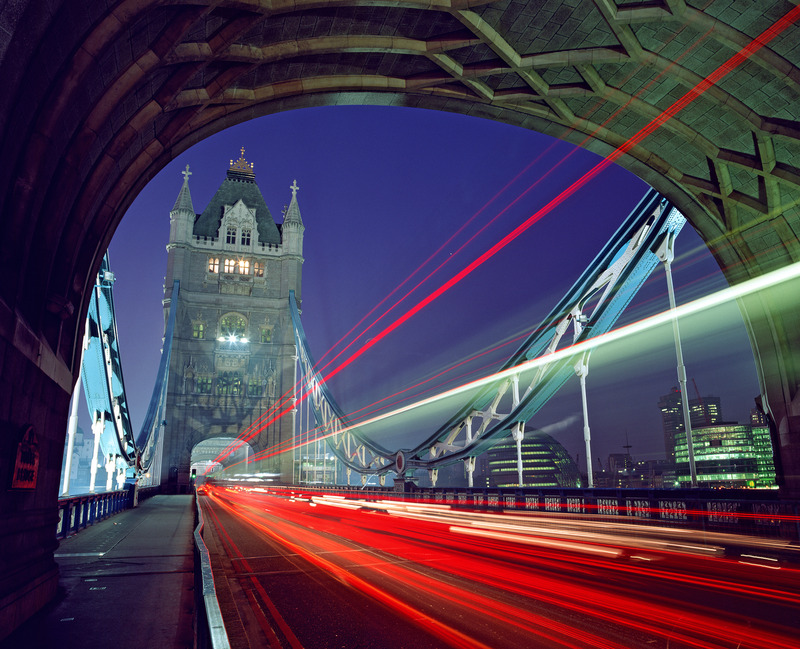 Anyone who sees this Bridge immediately knows that it’s in London (so it’s often the first thing shown in stock footage about London). It’s certainly a beautiful bridge. 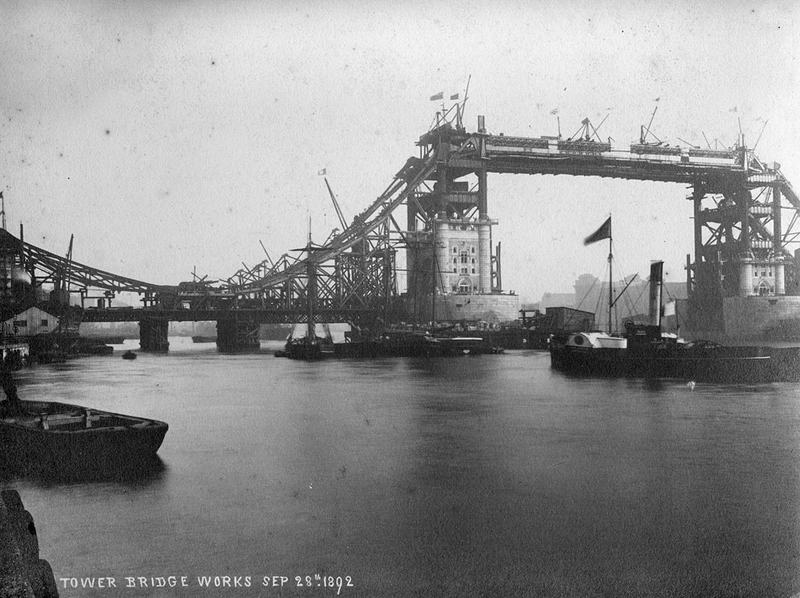 The Bridge is celebrating its birthday today – it was opened on this day in 1894 by the Prince of Wales, (the future King Edward VII) with much celebration. So, with much fanfare, here are 10 facts and figures you probably didn’t know about the iconic Bridge. 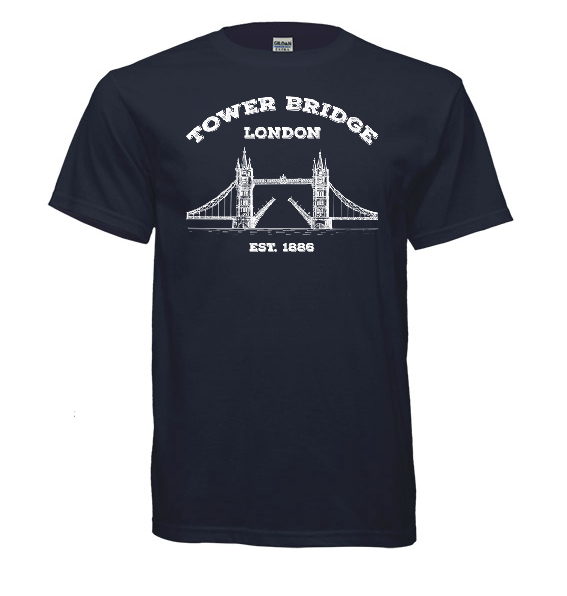 There still 72 hours left to pick up our exclusive tribute to Tower Bridge! Available in men’s, women’s, v-neck, long sleeve, hoodie and sweatshirt starting at $16.99 and shipping worldwide. It’s a common misconception that the bridge is called London Bridge (and that there’s a song about it). 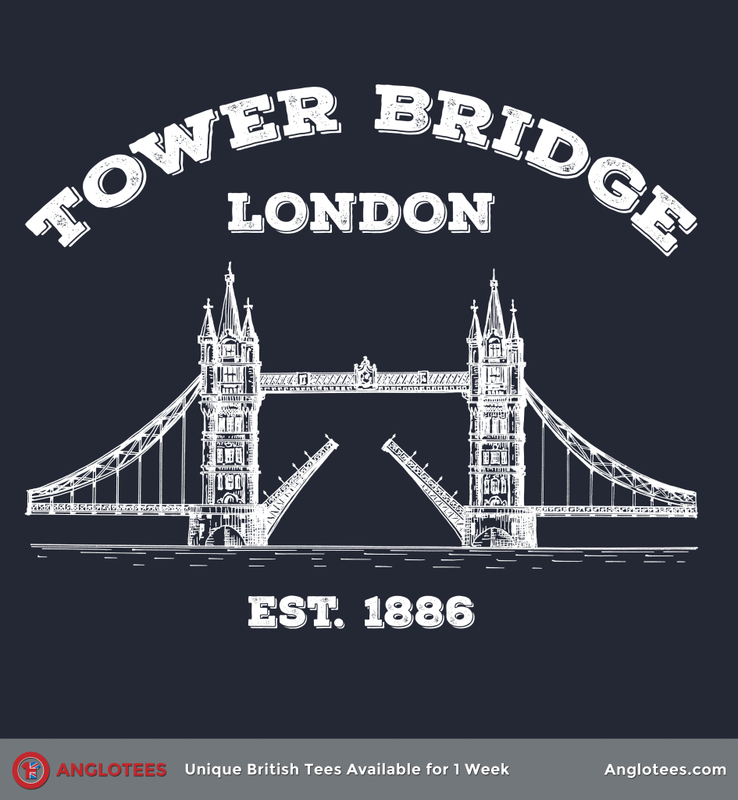 This is actually called Tower Bridge, London Bridge is further down the river and is much more utilitarian. When the decision was taken to build a bridge, a design contest was held to choose the best design. Over 50 designs were submitted – some close to what was built and some that were absolutely bonkers. The evaluation of the designs was surrounded by controversy, and it was not until 1884 that a design submitted by Sir Horace Jones, the City Architect (who was also one of the judges), was approved. Check out a gallery of the other designs here. There’s a live HD Webcam trained on Tower Bridge 24 hours a day. Watch it here. Tower Bridge isn’t named so because it is one of the few bridges on the Thames that features towers. In fact, it’s named after the Tower of London which is located on one side of the Bridge. The Tower of London also influenced the final design. The bridge is 800 feet (244 m) in length with two towers each 213 feet (65 m) high, built on piers. The central span of 200 feet (61 m) between the towers is split into two equal bascules or leaves, which can be raised to an angle of 86 degrees to allow river traffic to pass. The bascules, weighing over 1,000 tons each, are counterbalanced to minimize the force required and allow raising in five minutes. The high-level open air walkways between the towers gained an unpleasant reputation as a haunt for prostitutes and pickpockets; as they were only accessible by stairs they were seldom used by regular pedestrians, and were closed in 1910. In 1982 they were reopened as part of the Tower Bridge Exhibition, a display housed in the bridge’s twin towers, the high-level walkways and the Victorian engine rooms. The bridge usually opens at least once a day and if you’re a boat that requires an opening, you need to book it in advance. The bascules are raised around 1000 times a year. River traffic is now much reduced, but it still takes priority over road traffic. Today, 24 hours’ notice is required before opening the bridge. There is no charge for vessels. You can see when the Bridge will open next on its website. It’s quite an amazing sight! The bridge is crossed by over 40,000 people every day and it is still a busy and vital crossing of the Thames. The bridge is on the London Inner Ring Road, and is on the eastern boundary of the London congestion charge zone. (Drivers do not incur a charge by crossing the bridge.) To maintain the integrity of the structure, the City of London Corporation has imposed a 20 miles per hour (32 km/h) speed restriction, and an 18 ton weight limit on vehicles using the bridge. A camera system measures the speed of traffic crossing the bridge, utilizing a number plate recognition system to send fixed penalty charges to speeding drivers. So, if you ever get to cross, don’t speed across – enjoy it as a leisurely pace or else you’ll get a ticket (even in a rental car!). Despite having an architectural design that makes the bridge look old, it is in fact a very modern piece of architecture as construction of the bridge began in 1886 at the height of the Victorian era. It was made of steel and consisted of two towers built on piers. The central span was split into two equal bascules or leaves and the towers were clad in stone to give a more “traditional” appearance to match nearby Tower of London. Tower Bridge is basically a steel frame clad in stone, a design principle not that dissimilar to modern buildings. More than 400 workers helped to build the bridge and over 70000 tons of concrete were was sunk to the bed of the River Thames to support the bridge. 11,000 tons of steel was used to construct the framework for Towers and Walkways. Visiting the Bridge: It costs nothing to visit, cross and admire the bridge. There is a museum on site called the Tower Bridge Exhibition that goes into the history of the bridge and they occasionally have special exhibitions. The museum has an admissions charge. Details here. A name practically synonymous with Britain and legendary fictional spy James Bond, Aston Martin was founded in 1913 by Lionel Martin and Robert Bramford. Martin was one of the early race car drivers and he and Bramford decided they wanted to start making their own cars, the first having been constructed out of a 1908 Isotta-Fraschini with a Coventry-Simplex engine. Between the wars, the company went bankrupt, but was ultimately saved by Sir David Brown, who bought Aston Martin and began transforming it into the luxury car company we know today. 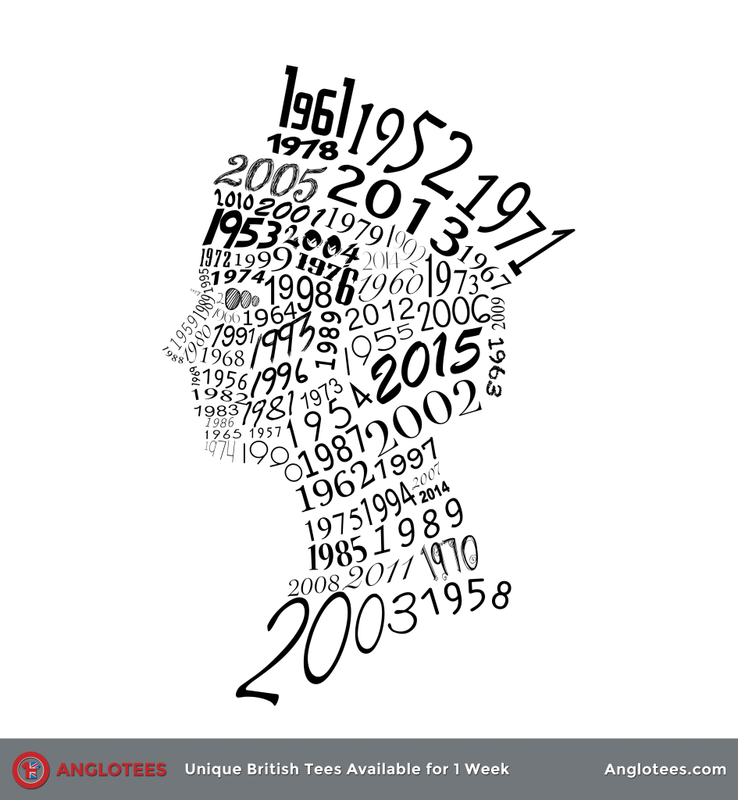 So what interesting facts are there about this British icon? Quite a lot. 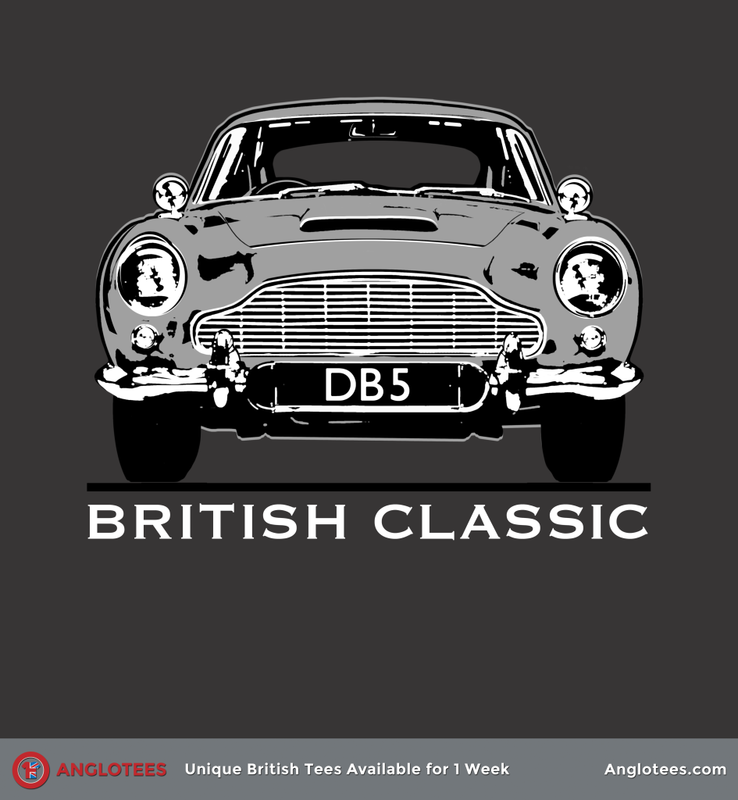 There just 72 hours left to pick up our loving tribute to James Bond’s iconic DB5. 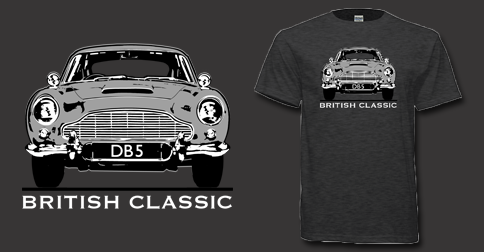 This design by Malcolm Watson is available in men’s, women’s, v-neck, long sleeve, hoodie and sweatshirt starting at $16.99 and shipping worldwide! The Aston Martin One-77 has been the fastest car from the firm, reaching a speed of 220.007 MPH. The company wasn’t in production for two years before “war were declared” and production shut down in 1915. Both Martin and Bramford joined the military and the company’s machinery was sold to Sopworth Aviation Company. 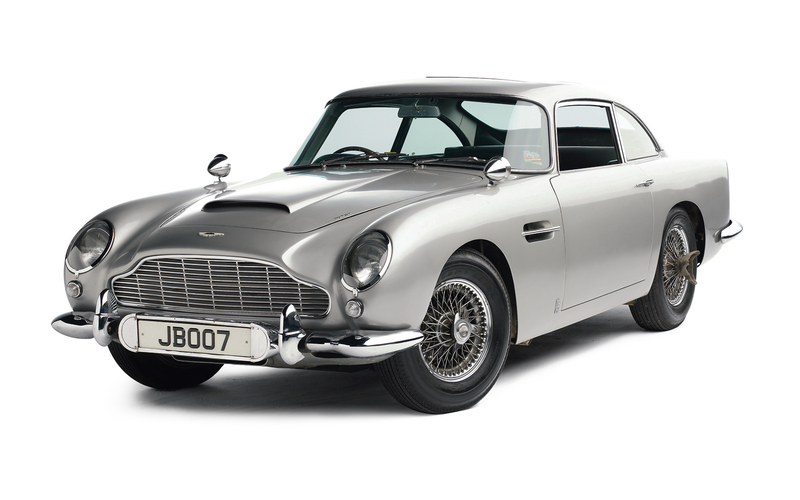 The original DB5 from Goldfinger, driven by Sir Sean Connery, was originally sold for only £5,000. When it was sold at auction in 2006, it reached over seven figures, coming in at one million pounds. The DB series isn’t the only model to appear in Bond films, as the V8 Vanquish made an appearance in The Living Daylights and the V12 Vanquish (with ridiculous camouflage gadget) appeared in Die Another Day. Every year, the Town of Le Mans, France hosts a grueling 24-hour endurance race on a closed circuit known as the Circuit de la Sarthe. The first time an Aston Martin car participated was in 1928 with the First Series. A car from the firm would not win the race until 1951 when three separate DB2 models placed first, second, and third. The Aston Martin Owners Club is celebrating its 80th year in 2015. There are 20 divisions of the club worldwide and it regularly puts on events for its members and even has a shop with bespoke Aston Martin items for those quite keen on such things. Speaking of the Aston Martin DBS and Casino Royale, the car actually set a record during production of the film. In the scene where Bond crashes the car after swerving to avoid a tied-up Vesper Lind, the car rolled 7 times. The Guinness Book of World confirmed it as a record for most cannon rolls by a car on 5 November 2006. Ford Motor Company became a shareholder in 1987 and eventually came to own the company with a majority share. The company was made part of Ford’s Premier Automotive Group, modernised the manufacturing process, and began to really ramp up production. After about 20 years of having a major stake in Aston Martin, Ford sold a majority of its shares to Prodrive founder David Richards, Aston Martin collector John Sinders, and Investment Dar and Adeem Investment Co, two international investment companies headquartered in Kuwait for $925 million. However, Ford still owns 8% of the firm. This article was written by Anglotopia.net Contributor John Rabon. The Royal Air Force has existed since 1918 and helps to keep Britain safe in the air as well aiding the efforts of ground forces. At the time it was formed, it was the largest air force in the world. It expanded even more during World War II and today is still one of the world’s leading air powers. 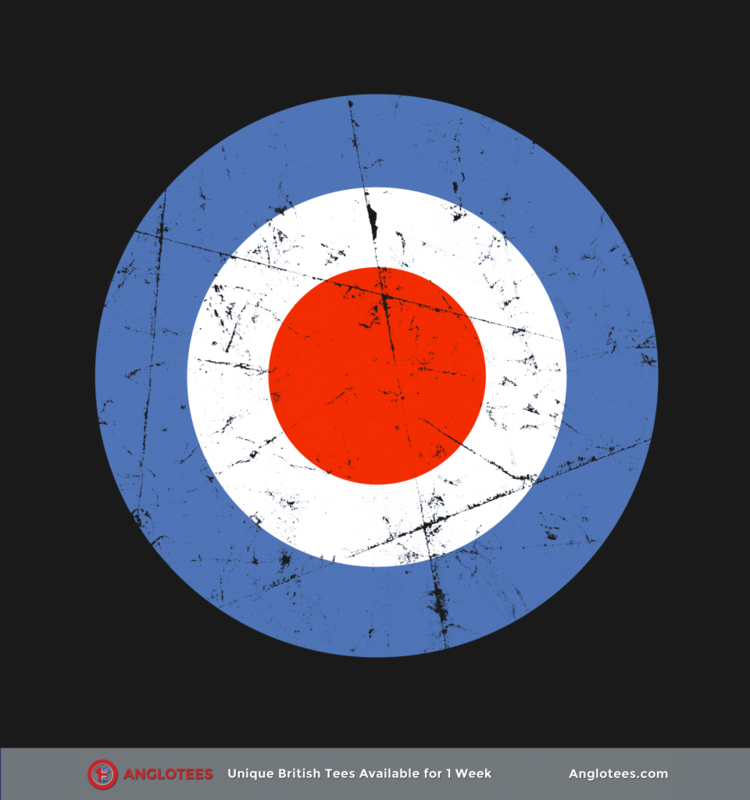 If you wanted to know more about the RAF, you’ve come to the right place. We here at Anglotees are ready to deliver with ten interesting facts that you may not have known. 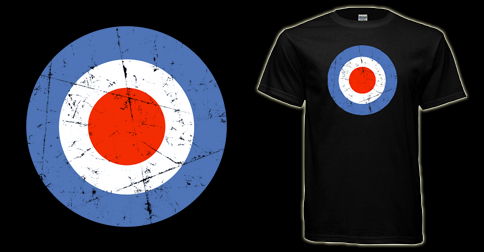 There’s still time left to get our exclusive tribute to the RAF a new design featuring the iconic RAF roundel. Available in men’s, women’s, v-neck, hoodie, sweatshirt and long sleeve starting at $16.99 and shipping worldwide. Order here now! 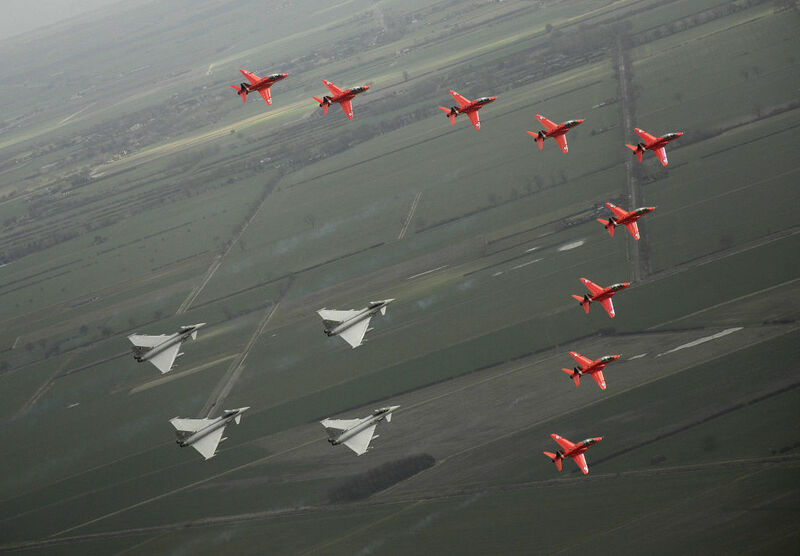 The RAF is known as a “junior” service because it is the last one to have formed. The Royal Marines formed in 1664. The British Army was formed as a standing army in 1660. The Royal Navy was formed under the reign of Henry VIII and, being the oldest of the military branches, is known as the “senior” service. During World War II, the RAF had the largest casualty rate, in part due to Britain’s bombing campaign against Germany. With 55,000 air crewman dying on these bombing missions, the RAF’s loss rate was the highest of any of the British armed forces during the war. The Gloster Meteor was the first jet fighter used by the RAF. It first flew in March 1943 and was introduced into the war in July 1944, though it saw limited action. Much like its German counterpart, the Messerschmitt ME-262, its introduction came a little late to have a significant effect on the war as the tide was already turning against the Axis Powers. During World War II, the RAF counted some 1,208,000 members, with 185,000 serving as aircrew. The motto of the RAF is “Per Ardua Ad Astra”, which is Latin for “By rough roads to the stars.” The RAF website suggests that the motto came from a young officer who had read the words in a book by Rider Haggard. Along with the Americans, the RAF was instrumental in the Berlin Airlift during the Cold War. Soviet forces in East Berlin and East Germany had the part of the city controlled by the Allies surrounded, hoping to convince the rest of Berlin to surrender. The RAF delivered 1,340 tons of supplies per day until the Soviets relented in October 1949. Perhaps the RAF’s finest hour was the Battle of Britain. Despite the fact that the Luftwaffe outnumbered the RAF 2-1 at the beginning of the war (4,000 planes to 2,000), the RAF had 1,000 of its own planes shot down during the battle while the Germans lost 1,800. The battle was won when Hitler decided to turn his attention to invading Russia. Part of the reason for this success was the development of radar that helped the RAF know when the Germans were coming and they could be ready for them. The first female jet pilot in the RAF was Flight Lieutenant Jo Salter in 1994, flying a Panavia Tornado. Now it is a common sight for both men and women to take to the skies for Britain. It was a common tradition for RAF pilots on missions in the first Gulf War to start singing “Always Look on the Bright Side of Life” from Monty Python’s Life of Brian. We’re quite surprised (and certainly pleased) that our Stonehenge t-shirt is selling well this week. Due to the interest in the design, we thought it would be fun to delve into the history of the place and focus on 10 interest facts and figures that people may not have known. Much about Stonehenge remains a mystery – the biggest unanswered question is when was it built? Archaeologists believe it was built anywhere from 3000 BC to 2000 BC. Radiocarbon dating done in 2008 suggested that the first stones were raised between 2400 and 2200 BC, whilst another theory suggests that bluestones may have been raised at the site as early as 3000 BC. Stonehenge has over 1,000,000 visitors from all over the world ever year – making it one of Britain’s most popular tourist attractions. When Stonehenge was first opened to the public it was possible to walk among and even climb on the stones, but the stones were roped off in 1977 as a result of serious erosion. Visitors are no longer permitted to touch the stones, but are able to walk around the monument from a short distance away. English Heritage does, however, permit access during the summer and winter solstice, and the spring and autumn equinox. Additionally, visitors can make special bookings to access the stones throughout the year. Some of the stones can weigh up to 60 tons. One of the biggest mysteries is how the builders managed to get them onto the site and lift them in the prehistoric era. The Stonehenge site is more than just the iconic stones at the center – the land surrounding the henge is a massive burial ground with over 200 people buried on the site. Some of the stones are Welsh bluestone – which only exists in Wales. The stones have been geologically placed to have in origin in western Wales – which is very far away from Wiltshire! Stonehenge used to be a neglected monument on some absentee landowner’s land (and much damage was done to the monument). Eventually it was decided to be too important to trust to private ownership and the British Crown now owns the site. It is managed by English Heritage and the land surrounding the site is owned by the National Trust (which has a remit to protect its properties forever). Those who built Stonehenge had to have been extremely sophisticated in mathematics and geometry. It was aligned with the midwinter sunset and the midsummer sunset. It was also aligned with the most northerly setting and most southerly rising of the moon. The monument is made of two major types of stone, sarsens and bluestones (mentioned above). Sarsens are the larger ones, some of them reaching 9m tall and weighing over 20 tons. They are thought to have come from the Marlborough Downs, around 20 miles from Salisbury Plain. 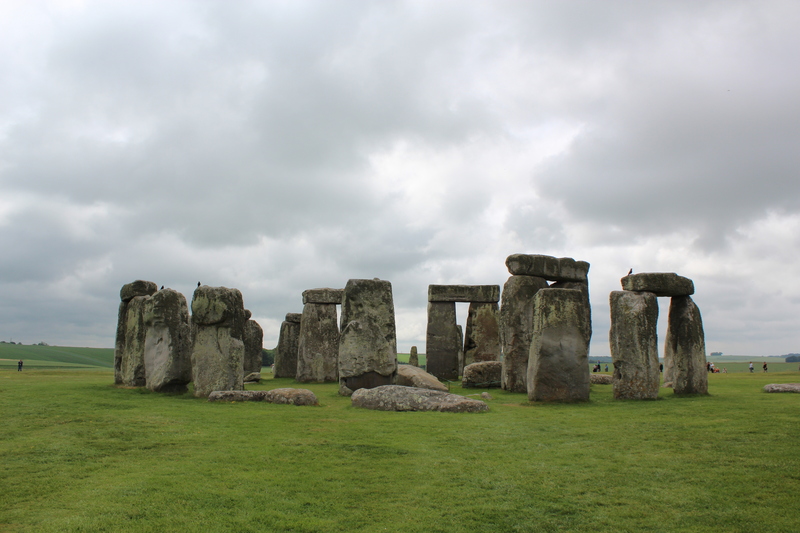 You can see Stonehenge from the main road – the A303 – as you drive by. This is also a major problem for the site as it creates a lot of road noise and pollution that damage the stones. The British government has just announced that they’re going to build tunnel under Stonehenge that will make the site almost as it was when it was built – silent to the winds of the Salisbury plain. 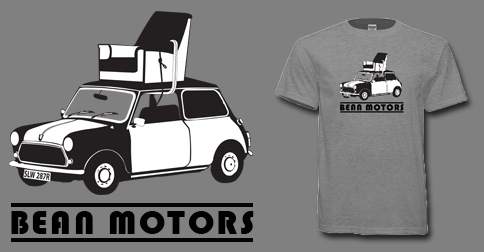 In honor of this week’s hit t-shirt dedicated to the iconic British comedy Mr Bean, we present 11 facts and figures about this iconic show you probably didn’t know. 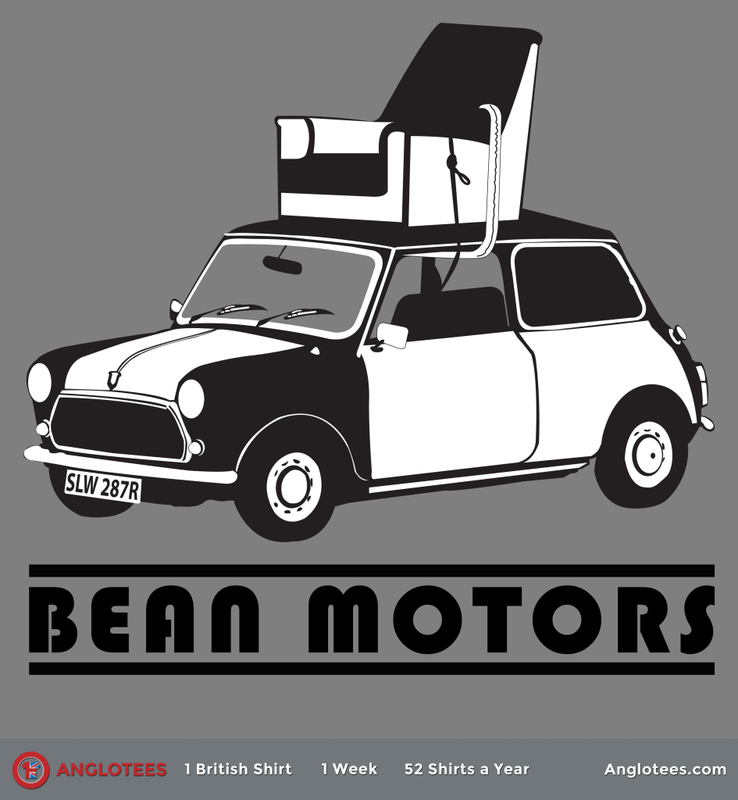 There’s still time left to pick up our design ‘Bean Motors.’ Available in men’s, women’s, v-neck, long sleeve and hoodie starting at $16.99 and shipping worldwide. All orders must be in by Friday at Noon US Central Time. ORDER HERE NOW! It’s highly probably that Mr Bean is the first British comedy that many people are exposed to (I know it was my first). That’s because it has been sold for transmission in a massive 245 territories! Despite the shows popularity – there are actually only 15 episodes of the show in existence (plus the movies we’d rather forget about). The show only ran from 1990 to 1995. The comedy, however, is timeless. Despite was most people probably think about the show it was not a creation of the BBC – in fact it aired on the British commercial network BBC Rival ITV. On the show, Mr Bean is generally are very poor character. Not so for the man who created him – Rowan Atkinson is reportedly worth $130 Million due to the success of the show, its spinoff movies as well as his other projects that have been big hit (like Johnny English). Mr Bean was developed while Atkinson was studying for his master’s degree in electrical engineering at Queen’s College, Oxford. A sketch featuring the character was performed at the Edinburgh Fringe in the early 1980s. 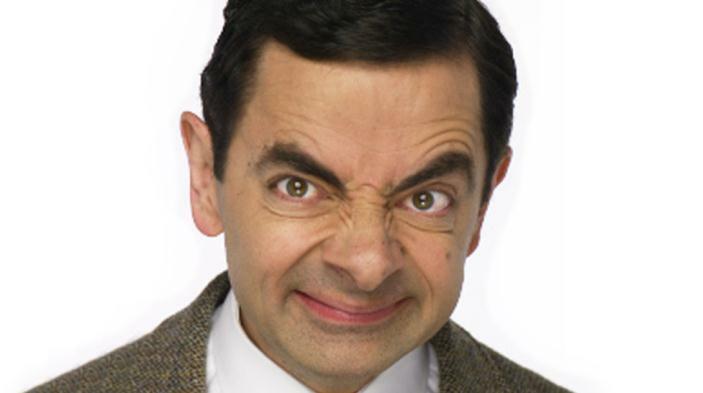 Mr Bean has over 63 MILLION fans on Facebook. Fans hail from all over the world and show the international popularity of this British buffoon. The page is updated regularly with comics, news videos and more. The people who created and produced the show have gone on to become icons of British entertainment. Rowan Atkinson has moved on to a successful film career. His series co-creator Richard Curtis has developed some of Britain’s best known movies such as Bridget Jones’ Diary, Notting Hill, Love Actually and many more. One of the producers, Sue Vertue is best known as the producer on BBC’s Sherlock – she also happens to be married to Doctor Who show runner Stephen Moffat. Since the show ended in 1995, Mr Bean has returned in two movies, which while not very good have made lots of money. He was also the star of an animated series – and there is a new animated series in development. He has also appeared in one off specials and famously made a cameo appearance at the opening ceremonies of the 2012 Olympics. Mr Bean last appeared on the big screen in 2007 in Mr Bean’s Holiday, which featured Bean going on vacation in France (an Englishman in France, how can that be funny????). The movie was comparatively cheap to produce but it grossed over $229 Million worldwide. Which makes you understand why Rowan Atkinson was non-plussed by the $1.4 million repair bill on one of his prized supercars involved in a crash. 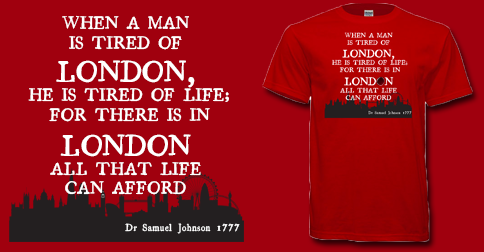 We’re quite chuffed at the popularity of our latest Anglotees T-shirt design called “Tired of London, Tired of Life” which features Dr Samuel Johnson’s iconic quote about London. This got us curious about Dr Johnson so we decided to investigate his life and find out more about him. 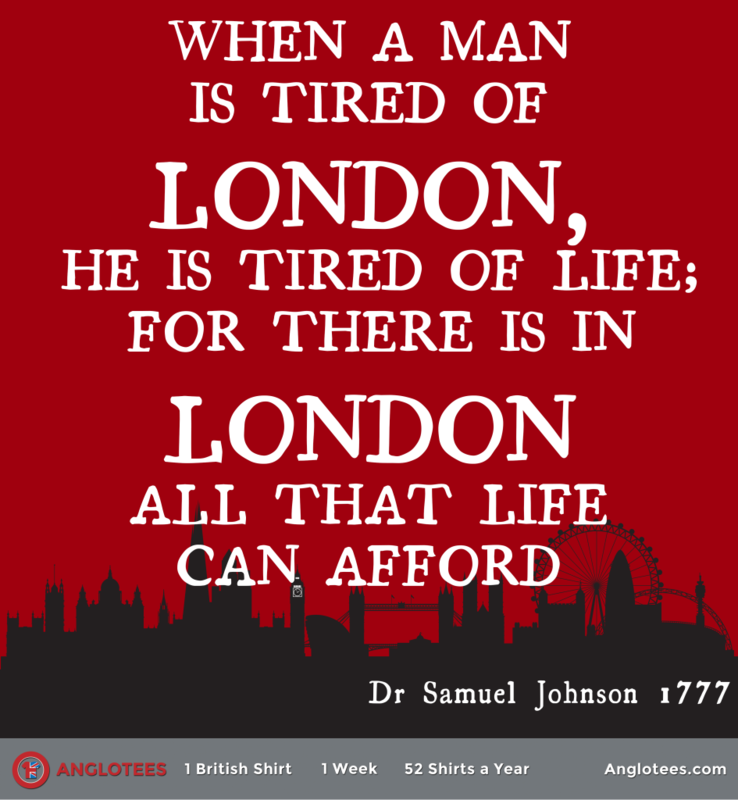 There’s still time left to pick up your own Tired of London, Tired of Life t-shirt available only until Friday, December 5th at Noon US Central Time. Available in men’s, women’s, v-neck, long sleeve and hoodie. Order here now! 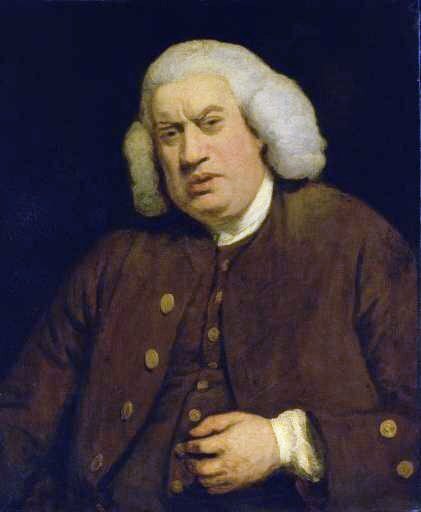 Samuel Johnson was born on 18 September 1709 and lived until 13 December 1784 – a rather long life for the age and he lived through most of the Georgian Era. Due to the general dissatisfaction with the English Dictionaries of the Day, a consortium of London publishers approached Johnson to write a new dictionary. He agreed but it took him nine years and he mostly did the work singlehandedly. It is widely regarded as one of the finest dictionaries ever published until the publication 173 years of the first Oxford English Dictionary. On more than one occasion Johnson was arrested for failing to replay debts he owed. He usually managed to get out of it. His odd gestures and tics were disconcerting to some on first meeting him. Biographies of Johnson, documented his odd behavior and mannerisms in such detail that they have informed the posthumous diagnosis of Tourette syndrome, a condition not defined or diagnosed in the 18th century. Johnson attended Pembroke College at Oxford but was unable to finish his degree due to his inability to pay the tuition bills. He was forced to leave the school and many of his prized books because he was too poor to transport them home. Eventually, just before the publication of his dictionary, he received a Master of Arts degree from Oxford. He was eventually awarded an honorary Doctorate in 1765. Johnson was good friends with a man named Harry Porter, who eventually died of a terminal illness. He became close to Porter’s wife, Elizabeth and he began courting her. This caused much controversy as she was 46 years old with three children and he was just 25, leading to a family scandal. In February 1767, Johnson was granted a special audience with King George III. This took place at the library of the Queen’s house, and it was organised by Barnard, the King’s librarian. The King, upon hearing that Johnson would visit the library, commanded that Barnard introduce him to Johnson. After a short meeting, Johnson was impressed both with the King himself and with their conversation. To help with household duties in his later years, Johnson hired a free slave Jamaican manservant named Francis Barber. He served Johnson from 1752 until Johnson’s death in 1784. Johnson made him his residual heir, with £70 a year to be given him by Trustees, expressing the wish that he move from London to Lichfield in Staffordshire, Johnson’s native city. After Johnson’s death in 1784, Barber did this, opening a draper’s shop and marrying a local woman. Barber was also left Johnson’s books and papers, and a gold watch. In later years he had acted as Johnson’s assistant in revising his famous Dictionary and other works. Though he was generally not political, he had strong words about America and its rebellion and the concept of patriotism, famously saying “Patriotism is the last refuge of a scoundrel.” Johnson also argued that in emigrating to America, colonists had “voluntarily resigned the power of voting”, but they still had “virtual representation” in Parliament. In a parody of the Declaration of Rights, Johnson suggested that the Americans had no more right to govern themselves than the Cornish people. If the Americans wanted to participate in Parliament, said Johnson, they could move to England and purchase an estate. Johnson denounced English supporters of American separatists as “traitors to this country”, and hoped that the matter would be settled without bloodshed, but he felt confident that it would end with “English superiority and American obedience”. So, there were a few things he ended up being wrong about! This article was written by regular Tardistopia.net contributor John Rabon. Happy Birthday Doctor Who! Today (November 23rd) in 1963, Doctor Who aired on the BBC for the first time. We’ve now had Doctor Who for over 51 years, and as this series continues to show, there are always reasons to watch. Of course, over such a long and illustrious television history, a programme builds up lots of interest facts about itself. Some of these you may know, others you may not, but in any event, they provide plenty of great moments on screen and behind the scenes. 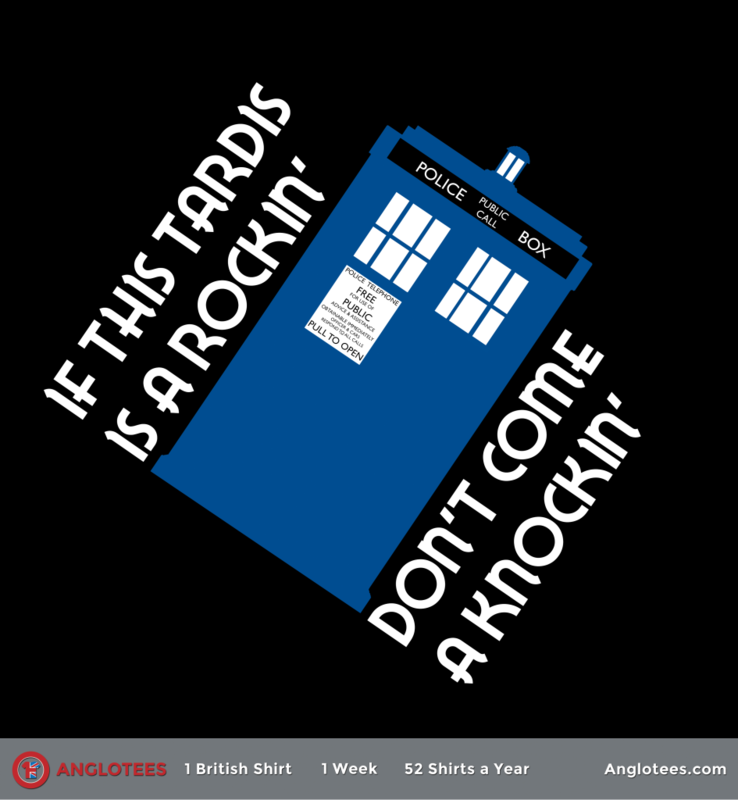 In celebration of the Doctor’s 51st Birthday, we have a fun Doctor Who T-shirt design available this week called ‘If This TARDIS is a Rockin’… and it’s a cheeky tribute to Doctor Who. Order here now. Rather than Raymond Cusick, it was very nearly director Ridley Scott who gave the Daleks their distinctive look. Scott worked as a designer at the BBC back in the 1960s and was originally slated to do the design work for “The Daleks” serial. However, before work on the serial began, Scott left to train as a director at Granada Studios and Cusick was tapped to replace him. For the first episode of the programme “An Unearthly Child”, the BBC had two firsts. Verity Lambert was chosen by head of drama Sydney Newman to be the show’s producer, becoming the first woman at the BBC to hold that position. Similarly, Waris Hussein was the BBC’s first Asian drama director, having directed his first programme in 1962 before moving onto Doctor Who the following year. Exactly what the Third Doctor, John Pertwee, did during his tenure on the show. A bit of a petrol head, Pertwee had a special spaceship-looking car commissioned for him and got permission to have it on the show. Dubbed “The Whomobile” by fans, it was never referred to by name on the programme as Barry Letts hated self-references within the show. So cool, in fact, that after Matt Smith started to wear them in 2011 for his Doctor’s costume, the sales shot up 94%. Smith decided to wear the bow tie after doing his research to prepare for the role and taking a liking to Patrick Troughton’s portrayal as the Second Doctor. There have been several instances when actual events dictated what happened on the programme. The first was the rebroadcast of the first episode, as the original broadcast was overlooked by viewers after the assassination of President John F. Kennedy. 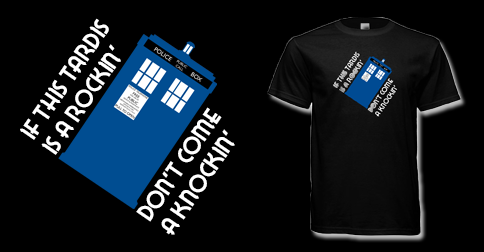 The second is the TARDIS itself. Originally meant to change appearance with each episode, the costliness of this caused the TARDIS to become stick in its familiar police box shape. Lastly, the whole idea of regeneration was created when William Hartnell left the programme so that the show could go on with a new actor, explained by the Doctor’s alien physiology allowing him to change form and personalities. The Weeping Angels, enemies that can only move when not being observed, were based on the game What’s the Time, Mr. Wolf? In the game, one player is chosen to be Mr. Wolf and stands at the opposite end of the field, facing away from the other players. The players chant “What’s the time, Mr. Wolf?” and the chosen player will shout out a time that requires the players to take the announced number of steps (3 = 3 steps, 12 = 12, etc.). Mr. Wolf can also shout out “Dinner time!” and chase the other players. If he tags another player, that player becomes the new Mr. Wolf. Stephen Fry was tapped to write an episode of the second series of the new programme by Russell T. Davies. Fry’s script was a play on the medieval story of “Sir Gawain and the Green Knight”. Unfortunately, Davies found the script overly complicated and Fry never got around to doing a rewrite, so it was never used. That honour goes to the Fourth Doctor serial “City of Death” with 16.1 million viewers for the classic series. For the new series, the anniversary special “The Day of the Doctor” brought in 10.61 million viewers in the UK and 3.6 million in the US. The box office figures for the theatre screening of the anniversary earned £1.8 million in the UK and $2.44 million in the US, becoming the second highest grossing that night. The Master was His Brother? Well…almost. Rodger Delgado, the first actor to portray the Master, was brought onto the programme in part because he was a friend of Jon Pertwee’s. There were plans for the Master to be revealed as the Doctor’s brother later in Pertwee’s era, but sadly, Delgado died before this could be realised. His death was part of the reason why Pertwee decided to leave the show after 1973. The Master would not reappear as a villain until 1976’s “The Deadly Assassin”. The Fourth Doctor was a Monk? At least, when he was at the age of 15. Tom Baker joined a monastery but came to dislike the discipline, chanting, and other hallmarks of monastic life, eventually leaving the church to pursue a career in acting. His iconic scarf almost didn’t happen. The scarf wasn’t meant to be as long as it was, but when the costume designer provided several balls of yarn to the knitter to pick the colors, she ended up using them all.